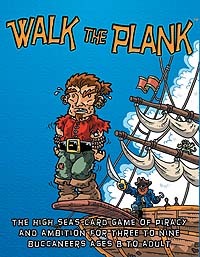 Walk the Plank is the fun, fast-paced card game of piracy and ambition. You are pirates on a ship without a captain, and who better to wear the captain's hat than you? Make your opponents walk the plank, avoid the sea monster, and if you've got the skill and luck to be the captain at the end of the game, you win! Walk the Plank is similar to classic trick-taking games like Hearts, Spades, Bridge, and Euchre, but with super-fast game play that relies both on luck and strategy. The game is easy for kids and adults to learn and master, and provides endless hours of entertainment. Make your friends Walk the Plank today!